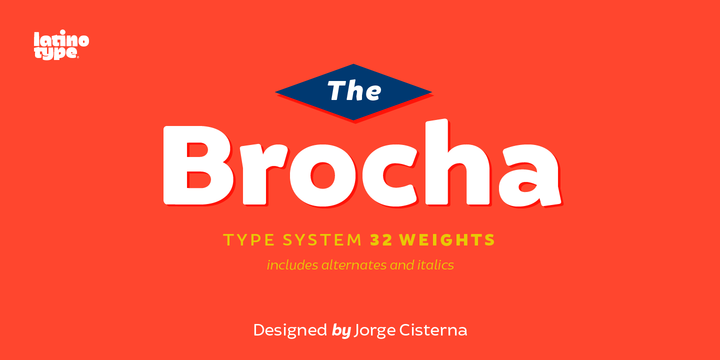 Brocha is a geometric sans serif typeface created by Jorge Cisterna and published by Latinotype. It is an old project, the author was inspired by pre-Columbian art for suchsketches. After several chances, ended with a family font of 32 typefaces, 2 subfamilies (basic & alternative), each have 8 weights (from Hair to Black) and italics. It is ideal for display, headline, magazine, logo or on cookies packaging designs. Price: starting from $26,00 for one font to $239,00 for all 32 fonts. A font description published on Thursday, October 15th, 2015 in Fonts, Jorge Cisterna, Latinotype by Alexandra that has 3,253 views.